Post-glacial sea level, combined with isostatic rebound, resulted in a sequence of Baltic lakes and seas. The term lake is used to mean a body of primarily fresh water. A sea is filled with brackish or salt water. In the history of the Baltic Sea, the distinction is not always clear. Salinity has varied with location, depth and time. The main factors are the advance or recession of the Scandinavian glacier and the isostatic sinking of the landforms due to the weight of ice or isostatic rebound (springing back) when relieved of it. The glacier provides a massive flow of fresh water. Salt water enters from the North Sea through straits when the sea level is high enough to allow reverse flow over the sill. When the straits are above sea level or close to sea level, fresh water will accumulate and a lake forms. 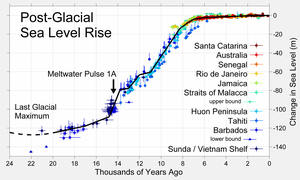 Fresh water will accumulate to levels substantially higher than sea level when the sills are substantially above sea level. The release of fresh water from the glaciers depends on climate; the presence or absence of entrances to the ocean depends on land rise and oceanic water level; the latter of course is also affected by the amount of ice held in glaciers worldwide. Several methods are used to determine the quality (temperature, salinity, solids content) of ancient sea water. The main one is the type of diatoms found in the sediment. Some species require salt water, while others require fresh. Other invertebrates serve as marker species as well. Also, periods of maximum supply from melt water are marked by low organic carbon in the sediment. Higher carbon content causes greater deposition of iron sulfide, which appears as a black varve. In this winter picture of modern Scandinavia the snow line approximates the edge of the glacier c. 10,000 A.D.. The lake egressed across Sweden just south of the line, through Vänern, which is visible. The edge of the retreating Weichselian glacier departed from the Lake Gardno end-moraines of northern Poland at around 14,000 A.D. and reached the southern shore of the Baltic Sea in the time window, 13,500/13,000 A.D. In the next several hundred years, closed fresh water pools formed in the southern Baltic region from melt water as the ice retreated northward. These were about 40 m (130 ft) above the current sea level. By 12,000 AD the edge of the glacier was at a line across southern Sweden to the northern shore of the Baltic countries. A connected body of water, the Ramsay Sea, stretched from the Danish islands region to the shores of Estonia. The Gulfs of Bothnia and Finland were still glaciated, as well as nearly all of Sweden north of Scania. In the Allerød warm period, rising land in the Denmark region created the Baltic Ice Lake. It egressed through a small channel in the Strait of Øresund. The lake was higher than sea level (which itself was lower than the present-day sea level) by some tens of metres. Lake Ladoga was part of it. Emergence of the land then closed the channel through the Strait of Öresund. The lake rose until at about 11,200 AD it broke through a narrow corridor in the region of Mount Billingen in present-day south-west Sweden; this used to be described by Quaternary geologists as a massive, single tap of Niagara-like force but it is now considered more likely that it happened in several steps over a limited period, perhaps a century, and along different local troughs and passages. By 10,800 AD, the lake had dropped 55 m (180 ft). At that point the climate reverted into cooling and during a cold climate period, the glacier advanced again over the central Swedish exit. The lake was blocked again, rose about 25 m (82 ft) and broke through the Strait of Oresund. By now, the Gulf of Finland had been deglaciated. At the peak of this high water phase, most of Finland was under water, including what is now Helsinki, at a depth of 115 m (377 ft); only southern Sweden was both free of ice and above the waterline. The Danish Islands were all connected west of the Strait of Oresund. Around 10,500 AD the climate became warmer, the ice retreated to the north of Mount Billingen, and the waters broke through central Sweden again, providing a second egress. Water level dropped 25 m (82 ft) to the sea level of that time. At about 16,000 AD the retreating ice had reached the southern shores of the present Baltic. Melt water formed extensive lacustrine systems still visible today in north Russia, Poland and Germany. By 14,600 AD the Baltic Ice Lake had come into existence. Beyond it only southern Sweden was habitable, and it was an island. 'Scandinavia' means "the island of Scandza" or "Scandia", which cannot be accounted for by today's map, and is generally assumed to be an inadvertent misrepresentation by ancient geographers. However, the first Scandinavia was an island, and was identical to southern Sweden. Several carbon-dated sites in Estonia indicate that human habitation of the shores of the Baltic Ice Lake began in the Boreal period, in the time window 11,200-10,200 AD. Charcoal, animal bones, and artefacts from Mesolithic temporary settlements have been found at Pulli and in the Lake Ladoga region. The diet included roe deer, red deer, marten, otter, wolf, bear and ringed seal. An open pine-birch forest covered the region. Pollen from Pinus, Betula, Alnus, Rosaceae, Cyperaceae and Artemisia have been found. Around 10,300 AD, the ice lake discharged through channels that opened in central Sweden (near Mount Billingen) until it reached the ocean level. The Yoldia Sea phase began (10,300-9,500 AD). This page was last edited on 23 April 2019, at 09:49 (UTC).